When bringing a new child into the world, having a safe and healthy environment is always important. The baby’s nursery is a critical space to think about and should be the home of natural and organic products whenever possible. In this blog post, we’ll dive into why organic products are worth investing in and which ones we recommend. Infants are incredibly vulnerable and sensitive to their environment, both in terms of what surrounds them and what directly comes into contact with their skin. Their immune systems are still developing and of course, are not as strong as the adult immune system. Infants and children also absorb nearly five times as much house dust as adults. Even the cleanest home is going to have dust and any off-gassing chemicals in the home from furniture, mattresses, or paint latch onto these dust particles. That’s why opting for organic and natural products is always preferred, whether toys, clothing or crib mattress. Integrating natural products from an early age also teaches children the importance of green living and sustainability. Yes, a baby is not going to know the difference, but over the years you can introduce the value of organic living to your kids through these products and through fun activities, such as gardening or composting. When shopping for baby furniture, you’ll want to look for the GOTS logo! GOTS stands for Global Organic Textile Standard. This is a rigorous organic certification that can be applied to either an individual component of a product (cotton, wool, etc.) or the entire product as a whole. GOTS-certified organic cotton, for example, is free of pesticides, bleach, or other harmful chemicals. When a product is completely GOTS-certified, that means that all of the components of the product have been evaluated as well as the actual manufacturing facility. It’s best to avoid synthetic materials whenever possible and opt for organic cotton, organic wool, natural latex, and sustainably-sourced wood with zero-VOC stains. The products in your nursery are some of the first items your baby is coming into contact with so you want them to be safe and pure. Organic and natural materials give parents peace of mind and considering that you’re already stressed out and running on little sleep, why not give yourself that little boost of reassurance? Thinking about specific safety features, particularly for a crib, is important. While they are no longer legally sold in the United States, make sure you are not using a crib with drop-side rails since these types of cribs have unfortunately proven to be dangerous. Crib rails should also be no more than 2 3/8” apart to ensure that your baby does not fall out of the crib. Toddlers using a crib have the risk of getting their head stuck between the slats if there is too much of a gap. While we understand that everyone’s price point varies when purchasing a crib, it’s best to purchase a new one that meets the safety requirements of the U.S. Consumer Product Safety Commission (CPSC) rather than using a used crib that may or may not meet said standards. When thinking about an actual crib mattress, it’s critical that it’s very firm. A softer mattress will not give a baby adequate support and could cause the child to “sink” into the mattress. Soft crib mattresses and even used crib mattresses have been linked to a higher risk of Sudden Infant Death Syndrome (SIDS). 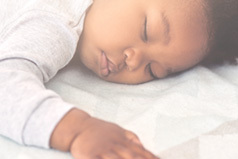 A 2002 study found that an infant was three times more likely to die from SIDS with a used crib mattress, most likely due to increased risk of exposure to bacteria, mold, mildew, and fungus. Savvy Rest offers a completely GOTS-certified organic crib mattress. The core of the crib mattress is made of firm Dunlop latex and the casing is certified organic cotton and certified organic wool. There are no synthetic materials or chemical flame retardants used. This is a safe and supportive crib mattress for growing infants. Savvy Rest also carries the Oeuf crib that is made with strict environmental and safety standards in mind. The Oeuf crib is made from solid birch wood sourced in Latvia and GREENGUARD GOLD certified, water-based, and non-toxic finishes. This crib is free of VOC health hazards and exceeds U.S. safety standards. You’re doing a great job! Researching and trying to figure out which products are best for your child is not easy. We hope this article has helped in some way as you get your nursery ready. All the reasons why the Savvy Baby organic crib mattress is the perfect choice for your baby. Your baby's nursery should be a safe, healthy, nurturing environment. But what exactly does that mean? Learn what types of crib mattresses are out there and why you should always opt for organic.